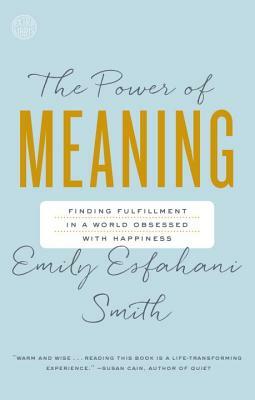 Emily Esfahani Smith is an author and writer who draws on psychology, philosophy, and literature to write about the human experience—why we are the way we are and how we can find grace and meaning in a world that is full of suffering. Her writing has appeared in the Wall Street Journal, New York Times, The Atlantic, TIME, and other publications. She is also an instructor in positive psychology at the University of Pennsylvania, as well as an editor at the Stanford University Hoover Institution, where she manages the Ben Franklin Circles project, a collaboration with the 92nd Street Y and Citizen University to build meaning in local communities. Born in Zurich, Switzerland, Emily grew up in Montreal, Canada. She graduated from Dartmouth College and earned a masters in applied positive psychology from the University of Pennsylvania. She lives with her husband in Washington, DC. “A beautiful book, full of hope. While drawing on the best scientific evidence, it also stirs us with powerful narratives of living full of meaning”.